Take the chicken and marinate with turmeric powder, Kashmiri red chili powder, ½ tbsp mustard oil and curd. Mix well and keep aside. In a pan roast the quartered onions, garlic clove and coriander leaves. Let them get a little charred. You can grill them as well. Set it aside to cool a little. Next grind all of them to a smooth paste. Add this smooth paste to the marinated chicken as well. Next heat the remaining oil and add 2 whole Kashmiri red chilies, 1 bay leaf and 3 small cardamoms to it. Next add the finely chopped onion and fry till light brown. Next add the ginger-garlic paste and fry well. Add the marinated chicken and fry well till the oil starts to separate. Add some water for the gravy. 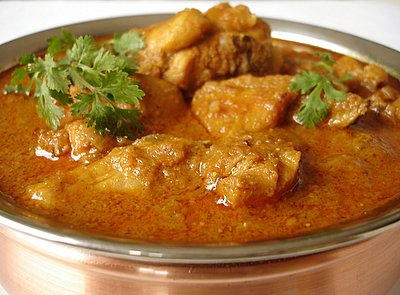 Once the gravy comes to a boil and the chicken is cooked, add ½ tsp garam masala.